Exporter of a wide range of products which include industrial slat conveyor chain. We are widely appreciated for offering a commendable range of Industrial Slat Conveyor Chain to the valued customers. These offered Chains is manufactured under the supremacy of our valued clients. Optimum quality raw material are used in the fabrication to meet varied specifications in an efficient manner and affluent manner. Patrons can avail these in various sizes and other specifications as per their requirements. Slat Conveyor Chains are very widely used in Industry for various Material Handling Applications in Industries like Fertilizers, Cement, Sugar, Mines and lot of other industries wherever there is automation in handling of materials. 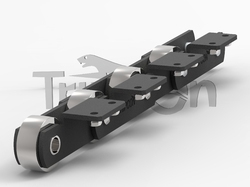 Tripcon Offers very wide range in Slat Conveyor Chains with various Pitches and upto breaking load of upto 200 MT. Looking for Slat Conveyor Chain ?